It was in 1985 at Alabang, Muntinlupa, Metro Manila when the Daughters of Virgin Mary Immaculate, a religious congregation of sisters founded in Italy, opened the doors of its first pre-elementary school in the Philippines. In the congregation’s desire to fulfill its vocation of taking care of the youth, the sisters addressed the pressing need to accept more school children. Expansion was considered but the limited space of their premises at Alabang made this extremely impossible. At Villa Olympia, a developing residential subdivision at San Pedro, Laguna, the sisters found space specifically reserved as school site. On their visits to this place, the sisters went about interviewing the residents. In the course of their inquiries, the residents expressed their desire and need for a good Catholic school. In July of 1988, the sisters signed an agreement with the developer of Villa Olympia on the purchase of a two-hectare lot. This marked the first definite step toward the fulfillment of the congregation’s commitment to serve the youth of San Pedro,City,Laguna. Two months later, construction of the concrete fence commenced, followed by the pre-school building and with their share of obstacle and trials, the school begins its journey. Nothing prevented the Sisters from pursuing their chosen goal with full vigor and eagerness. 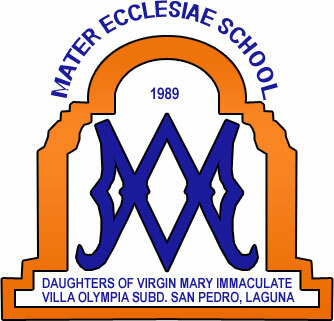 In 1989, Mater Ecclesiae School (Mother of the Church) named after the congregation’s patroness, Mother Mary, was incorporated. During its first year of operation, the school offered only Nursery, Kinder Prep and Grade I programs. Despite the small number of students in the initial year, the school maintained three teachers, an office staff and a janitor supervised by two sisters. The school continued with its expansion program. A month after the opening of classes in the first year, construction of the gymnasium started. In the school year 1990-1991, the school offered Grade II classes, during which year, a marked increase in the number of enrollees was observed. The demands of education forced the institute to go on and finally built the 3-storey building for elementary grade school, with complete facilities that the children need for the betterment of their learning. In the school year 1995-1996, there was the first commencement exercises in the elementary school. The graduates represented the first batch of students in the secondary level. The students had to use, for the time being, the remaining classrooms at the elementary building. In God’s providence, construction work of the high school building started on Jan. 7, 1996, and finally finished on May 15, 1997. This great development is to continue the task entrusted to the Congregation of the Daughters of Virgin Mary Immaculate – the commitment of providing Catholic education to the youth with the specific objective of proclaiming the glory of God entrusted bu the Church. The congregation aims to accomplish this task by instilling basic Christian Formation in young boys and girls, the Gospel, teachings of the Church and the spirit of the Founders of the congregation.